The Center for Law and Social Policy reports that on any given day, approximately 57,000 youth in the United States are in juvenile detention and correctional facilities with hundreds of thousands more on probation. Youth of color are disproportionately represented in this population. According to a study by the Minnesota Department of Public Safety, 75 to 93 percent of youth in the juvenile justice system report exposure to trauma versus 25 to 34 percent of all youth. According to the U.S. Interagency Working Group on Youth Programs (youth.gov), there is a significant increase in a young person’s likelihood of being involved in the juvenile justice system the year following suspension or expulsion from school. The YMCA of the Greater Twin Cities, a leading nonprofit dedicated to strengthening communities through youth development, healthy living and social responsibility, partners with the community to provide support and resources for Minnesota youth facing barriers to success due to involvement in the juvenile justice system. Studies show that involvement in the juvenile justice system has a negative impact on young people’s education and employment prospects. The YMCA Youth Intervention Services team employs a positive youth development approach to build on young people’s strengths and partner with them to achieve success. Assist young people transitioning back into the community. Remove barriers and provide resources to obtain proper identification, secure transportation, build life skills, prepare for independent living and more. Empower young people to accomplish goals and successfully complete probation. Support young people’s education goals to complete high school or pursue post-secondary opportunities. Connect to prosocial activities in the young person’s community. Build relationships and connect youth to caring adults and positive role models. See how the Y has partnered with Ayan and her probation officer to connect to resources and opportunities, and set new goals for the future – Helping Youth Realize Their Potential: Ayan’s Story. Discover how Daterius has built a relationship with his Y youth support specialist Kelvin and learned to channel his emotions in new ways – Helping Youth Realize Their Potential: Daterius’ Story. Learn how Paul has made positive changes in his life and connected to new education and employment opportunities with the support of his Y youth support specialist – Helping Youth Realize Their Potential: Paul’s Story. YMCA Youth Intervention Services offers many additional programs to meet the needs of youth experiencing homelessness, involvement with the juvenile justice or foster care systems, or who are disconnected from their school or community. 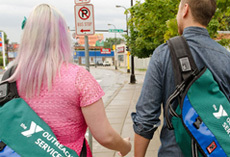 Among these services is the Youth Resource Line, a free resource staffed 365 days a year by Y team members to assist youth ages 12 to 24 who are in need of community resources: 763-493-3052. Because the Y is a leading nonprofit committed to helping all young people thrive, financial assistance is available to those in need. With the generous support of community members, the Y ensures that all have the opportunity to participate. To learn more about the Y’s Youth Intervention Services and other youth development programs, please visit ymcamn.org.